And yes, am going to finally share you my recent DIY project that I’ve been working on for weeks. 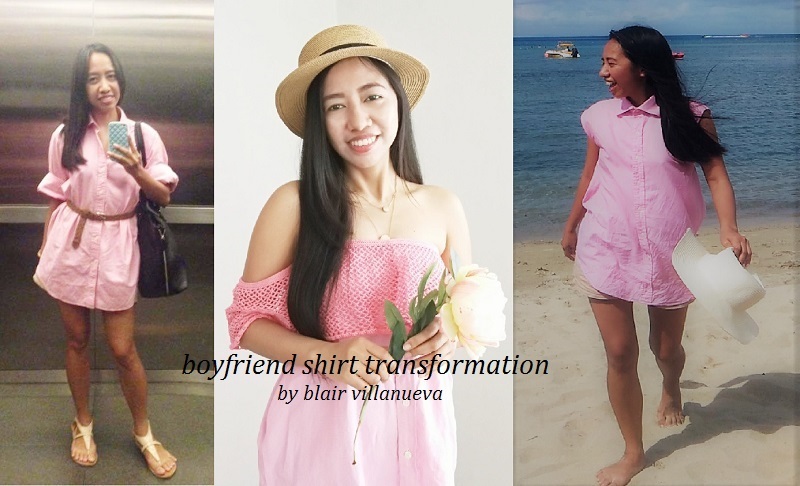 I was so excited to share you how I transformed my pink boyfriend shirt in three looks since I’ve bought it last year from a thrift shirt. It is my hobby to visit some thrift stores (or we called it ukay-ukay stores in the Philippines) to haunt for some pieces that I could mix-and-match with my current clothes. Am a certified cheapskate (LOL) and I rarely bur brand new clothes, (unless it is necessary) so a trip to various thrift stores is like an adventures for me! During weekend of my thrift store haunting, I will wear my usual huge t-shirt with shorts underneath, paired with my old rubber shoes, having some cash with me (thrift stores doesn’t accept credit cards, and it’s also better because I could just stick to my budget), and bringing my foldable eco-shopping bag (I prefer it that using plastics). 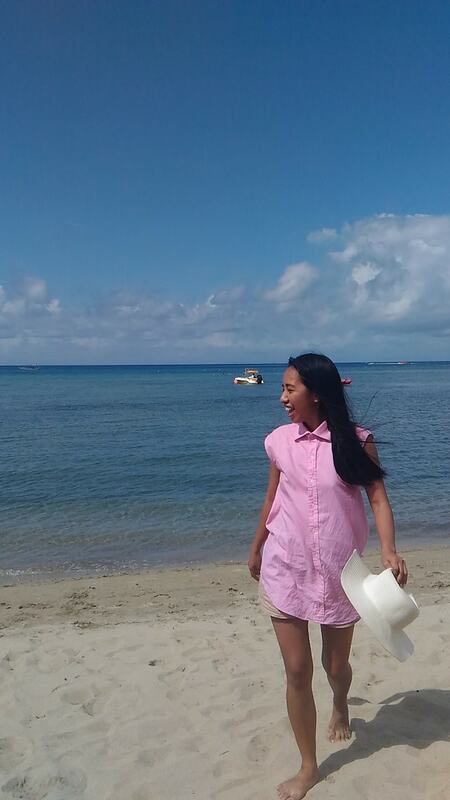 So this pink boyfriend shirt which I’ve bought from a thrift store for Php80.00 is one of my favourite. Not only its huge, it is also have a good fabric – no wonder because its label is T.M. Lewin. T.M Lewin is one of the best label for men shirts and they are absolutely gorgeous! They are in the mid-range of brand (unlike Ralph Lauren) but the cut and silhouette will make you man a gentleman. I felt so happy, and instantly have a vision of my look for this shirt. It was like love at first sight. Yes so huge I could wear it as a mini-dress! And rolled-up the sleeve, add a belt and am ready to go! Isn’t so cute?! I bought this shirt last year January 2016. Then comes March 2016, for my best friend’s wedding (I still can’t believe she got married ahead of me, LOL – this year we are anticipating her first born!). We had our last single’s sleepover and I need something comfy. So I decided to shorten and cut the sleeves of my pink shirt. Yeah when I got bored I always run to my closet and start transforming my old clothes, LOL! I felt satisfied then, until I got bored again on April 2016. 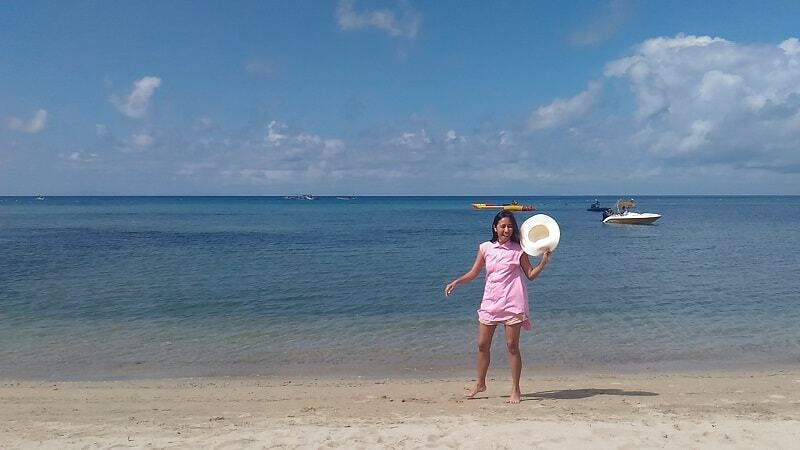 It was taken during last year’s summer getaway with my colleagues at Laiya Beach, and I needed something more comfy. Oh how I miss the beach! Those crystal white beach that I love to play with, and never mind the heat of the sun (its okay I have my sunscreen lotion, hahaha). So for the past months, I satisfied myself on this shirt and wear it for many times. Until January 2017 comes in. 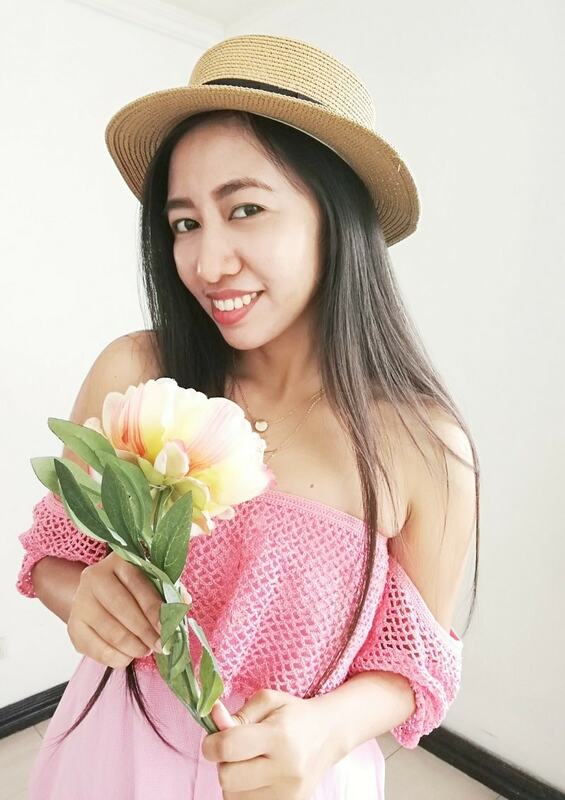 Recently I got fascinated with off-shoulder top DIY, and as much as possible I don’t like to buy one because its freak in expensive, and I know exactly how to sew it. 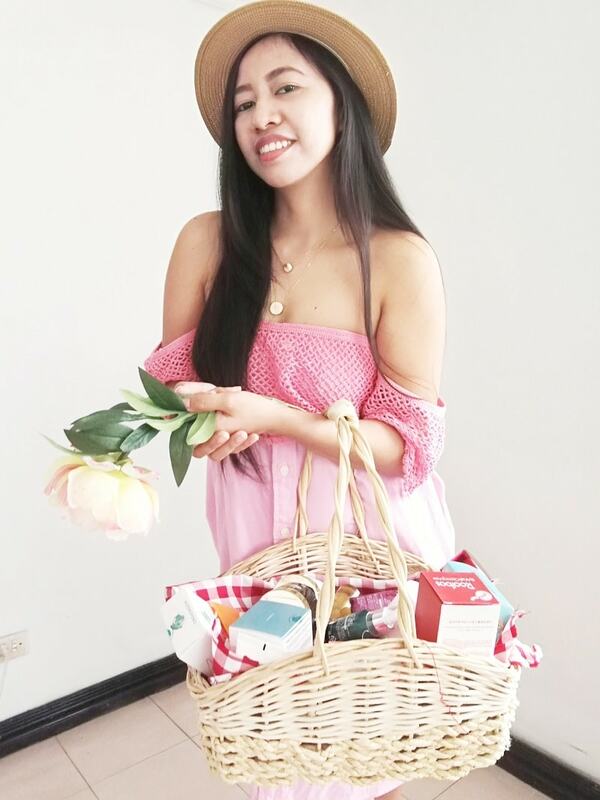 I was thinking of something summery and sweet look in preparation for the coming summer season. 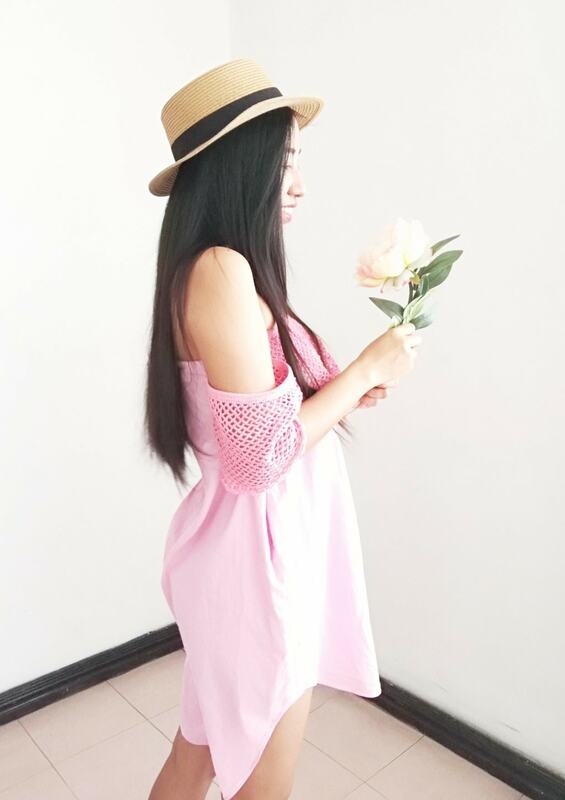 And nothing is sweeter than the pink color, so I haunt for my old pink boyfriend shirt, and start planning. Did I mentioned previously that I also love crocheting? Yes that also one of my home hobby. I love crocheting and I could stay at home just doing a crocheting project. And of course while watching a re-run series of The Mentalist. Okay enough for Simon Baker fantasy – and if you are interested I might share some on a different post. So back to crocheting – I’ve bought 2 balls of crocheting thread from the mall at Php38.00 each. 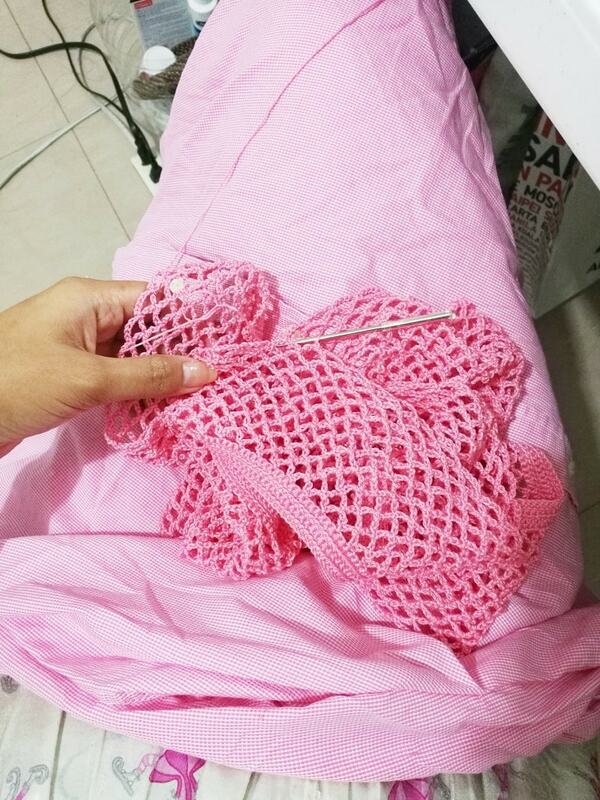 I was thinking of creating a crocheted pink lace that I could add-up to my boyfriend shirt. It took my almost 6-weeks to finished this crocheted lace because I didn’t do it continuously (only when I was in my crocheting mood). 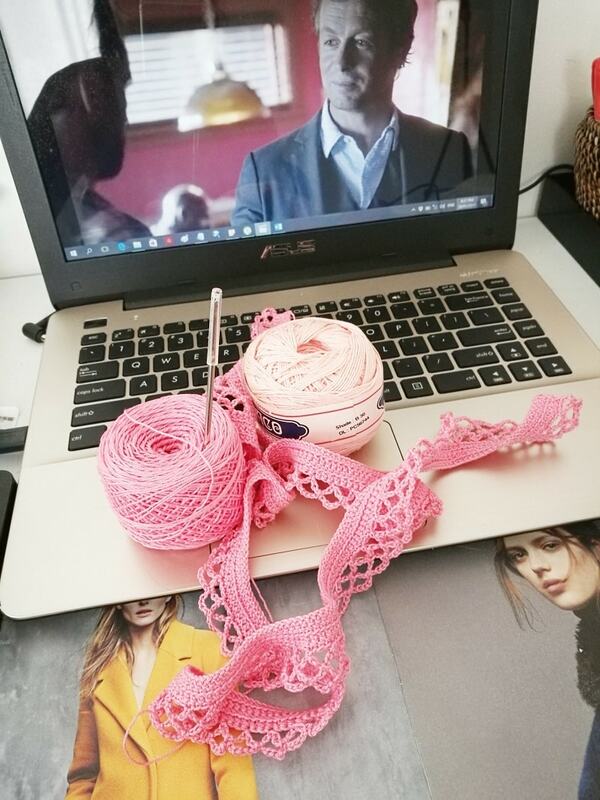 Then comes last weekend (11th of February) when I finished the crocheted lace, and attached it to my pink boyfriend shirt. 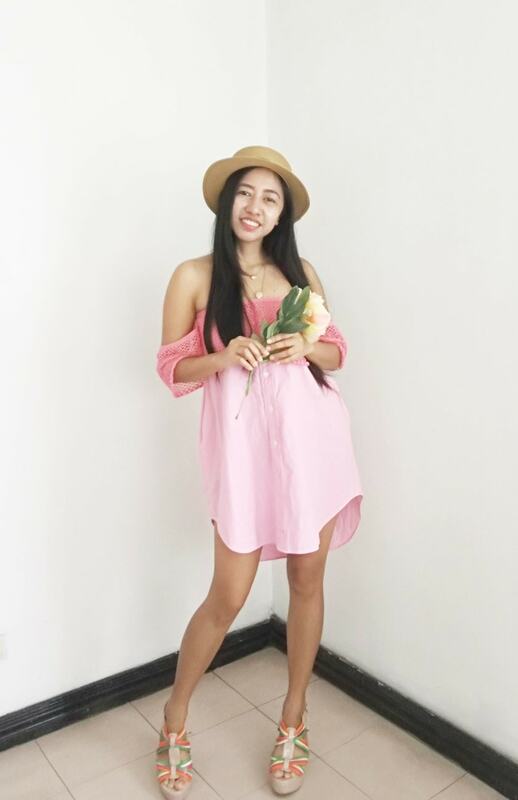 Finally this new sweet and summer look seems more satisfying and I couldn’t help but to have a few photos, hahaha. 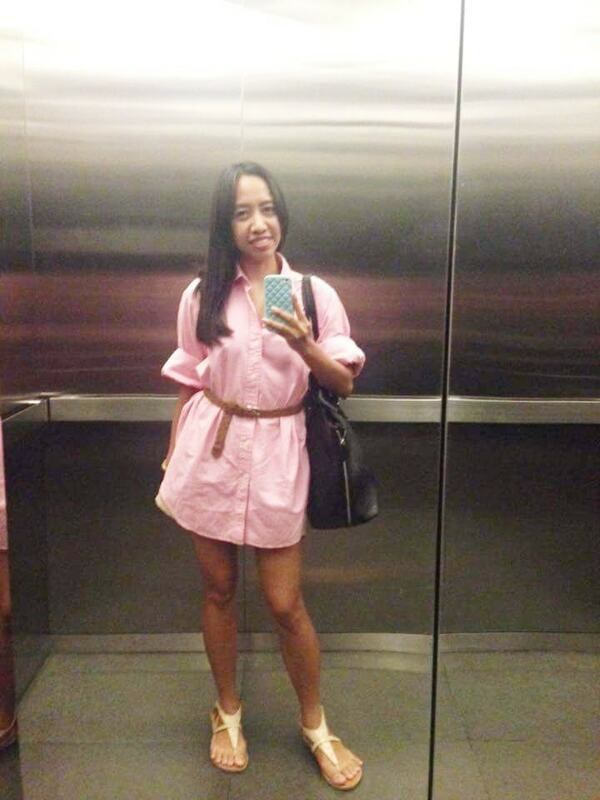 Am rarely share OOTD photos but this time my DIY Pink Boyfriend Shirt deserves some flaunting, don’t you think? I’ve used two crochet thread for the lace and VIOLA! Looks like am ready to visit the garden and pick some fresh flowers along the way! What do you think of my new DIY? I would love to read your comments below! Oh my gosh, I am so impressed! You did a fabulous job and look amazing in that. Gorgeous flowers too. How awesome! I love the final product you came up with. I shop at thrift stores seriously all the time! Me too if I have time. You're so talented. I wish I knew how to crochet like you. Great transformation. You can still learn how to crochet. There are many video tutorials online. I just learned from my old Aunties during my childhood days. You're really good in transforming your bf's shirts to suit your fashion sense :P I guess he has to keep buying new clothes LOL. But I do sometimes splurge for things like investment jewelries, luxury accommodation and high-end restaurants especially when we travel :) Am only a cheapstake in clothing! That is such a cute look. I really need to upcycle some of my old clothes. I agree and you must! Just think about how much you can save for a dress.. you can spend it to your travel or much necessary expenses. I love the last DIY! I'm a knitter but never thought to combine it with other outfits. Good idea!! Wow what an amazing DIY project.The final project looks great! You're so creative! I'd never be able to do stuff like that. I can't even sew up any rips in my clothes! During my grade school days, we are taught how to sew. And even at home, my Mom owns a sewing machine and also guided and teaches me how to sew, and also operate her sewing machine. It became a bonding for us. So all of my siblings knows how to sew. I love this idea!! I love wearing my bf's shirts because they are so comfy!! I loved how you styled these! Maybe you can turn your boyfriend's shirts too into something cutesy! Nowadays I did DIY whenever am feeling bored and to keep me occupied. You are so crafty! Look what you did with just a button blouse. WOW just WOW!!!!!!!!!!!!! Oh my goodness that is so cute! I love how you incorporated the lace with the shirt. You have some amazing skills! Too cute. I love it. I love bf shirts, lol. I didn't realize that's what you call them. But this pink shirt is what I've bought from thrift store. Wow! Love how you completely transformed the look of a men's shirt- no less. I just wouldn't be able to do that! This is really nice! 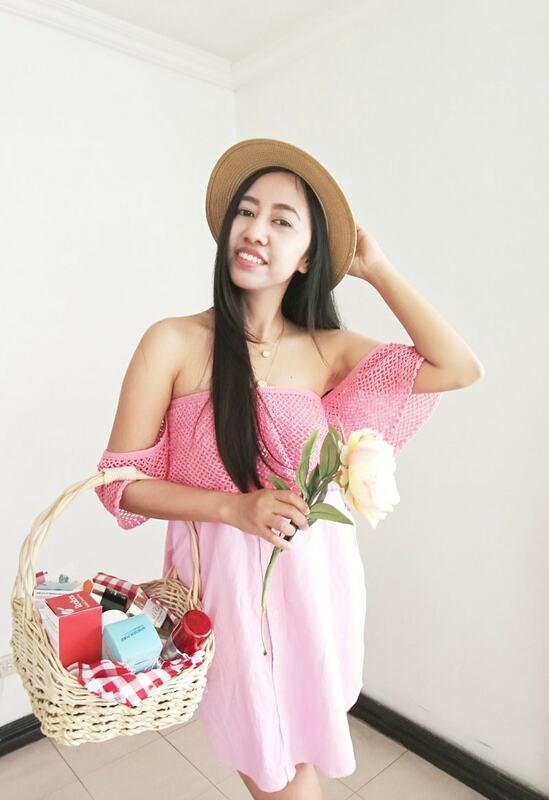 Off shoulder clothes is a thing right now and it shows that by DIY you can be fashionably affordable too! Wow~ You're so talented! It look a lot better after transform. Wow! You are very creative! Who would have thought its the same and only one dress! Well done for the last one! I love the crochet design! I just home I won't get bored again with this dress, LOL. But perhaps I'll turn to other shirt next time. More DIY SOON! Blair you always seem to be doing soo much.Loved the crocheted off shoulder summer dress look best. Thank you! The crocheting part is quite tedious to do, and sometimes I fell asleep doing it, lol that's why it took so long to finished. WOW super creative, my fave was actually the middle version with no sleeves, I could absolutely do that on the beach as a coverup. Thanks! Yeah so easy to make right? Just cut the sleeves and viola, new outfit! Very cute creation. I love to do stuff like this too. Absolutely great information. Thanks for sharing. That is such a great diy! So simple but it completely changes the look. I would love to make more! Summer is here and its time for more diy. I used to wear my BF shirts in a very similar way to the final outcome, except I didn't have that amazing crochet work! I think this looks amazing! It's an awesome transformation. I love how creative you are especially with the last style. It's perfect for the summer as well! This is so cute! I love how you did it yourself! How fun is this DIY?! 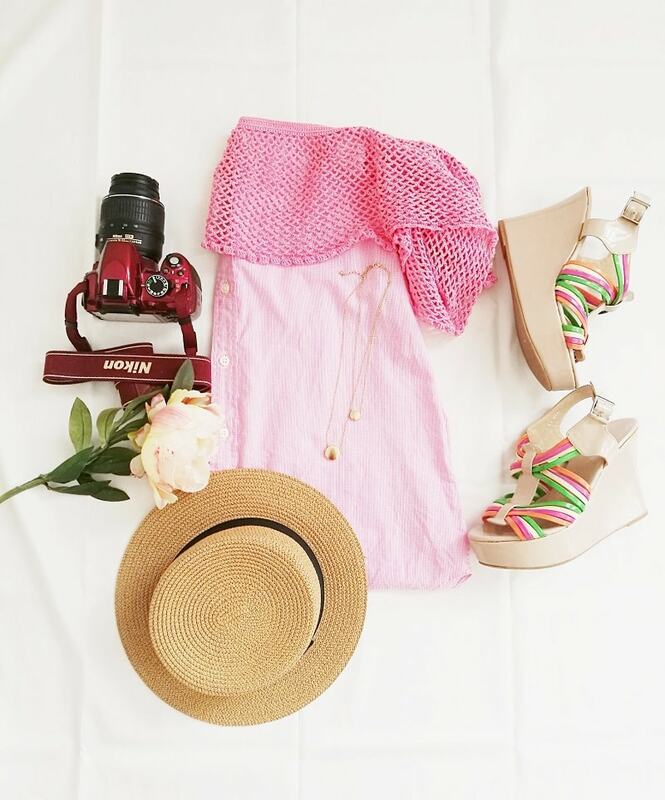 I love the soft pink and the accent you added made the dress so adorable! Wow Blair! You've given a new look to your boyfriend's shirt! Loved its transformation into pink shift dress. Thanks for the inspiration. Maybe, I'll stole my hubby shirt and try to experiment something with it! OMG! You are truly talented. That is how you get the most out of your wardrobe. I love the final look, the crochet portion really puts it over the top. This look is my favorite for such! Thank Laveena! I've found some spare shirt that I will DIY soon! That looks so amazing!!! This is such an awesome DIY dear!! Love it!! First, which Ukay Ukay store did you visit? Super good find! Second, great take on the off shoulder trend! Wow, you made it really cute. Great job. Yeah I did design for my dresses ( I should share it here soon!) But mostly I like deconstructing clothes making it something new, an saves me a lot of cash. I was thinking - if I have a baby, I might DIY most of her/his clothes! Wow, good for you! I love what you did with it. It came out awesome. Thank you dear! Summer means new summer outfit, but not aiming to drain my pocket so here I am DYIng! That is so cute! You are so talented! I would have never come up with such an adorable design! Your style is amazing. You have a great sense of fashion! Wow, what a great transformation! I love to crochet too and WISH I could sew! I'd rather hand-sew than buy a machine, but my sewing never seems to last long before it falls apart! 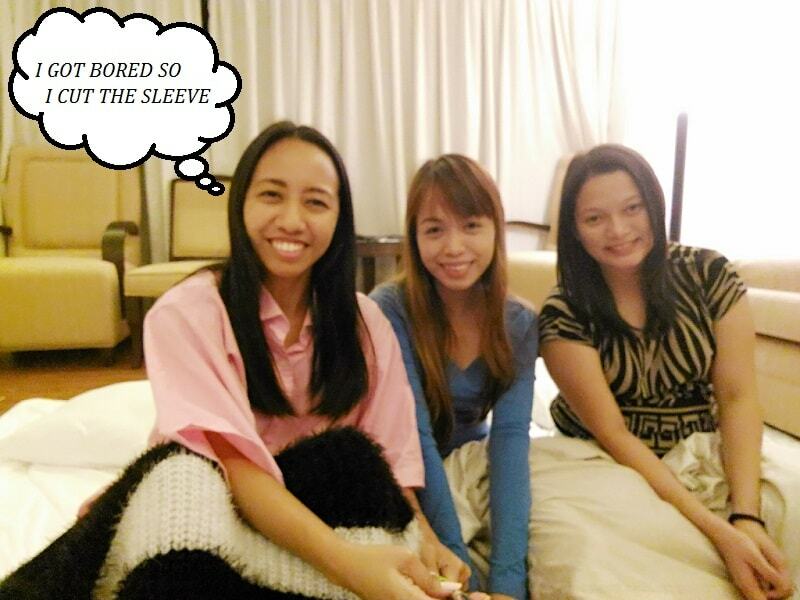 For now, I have to endure the hand-sewing, because am still saving for a sewing machine :) Thanks for visiting Brandi! SO creative and absolutely awesome! I love the color too! This transformation is super cute. I love how you were able to envision so much for this shirt! This is such a great DIY! 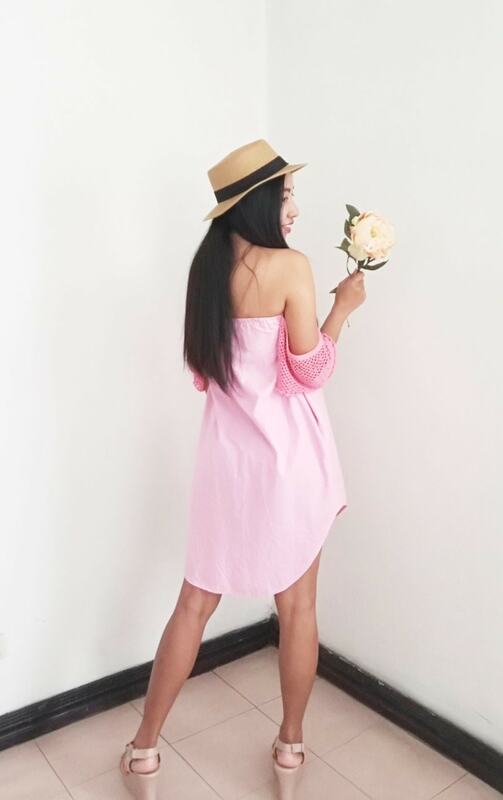 I love wearing mens shirts as dresses, just add a belt and you have a cute outfit. Love that top you made, its adorable! I am impressed by your thriftiness. Just how you can change things and make other things is simply amazing. And as for how it looks on you, all I can say is wow. You look gorgeous. Wow! I really love what you did with it! The final look is my favourite, how clever, and those shoes!!! Thanks you so much Courtney! Oh, wow! What a fabulous transformation and beautiful photos, too. I love your style! Very comfy and laid back but still trendy and stylish. It's nice to be able to transform a shirt like this! How cool! Your sense of fashion is quite impressive. You simply rocked in new look of the shirt. What a great makeover idea. Loved it. Woah! Your skills are amazing! I think it's a good thing when you get bored of how it looks because you get to transform it more beautifully! Wow what a great job you did! I wish I could crochet like that !!! Lovely idea. And a good DIY I will say. I wish I could be so creative. Thank you dear! I am now eyeing for my boyfriend's old shirt for my next DIY.